Saw some of these a while back and thought wow neat idea, My first attempt well let’s just say not so great! Then I made a carbide rougher but had nothing really to try it out on, so glued up some scrap cedar and gave the rougher a work out. Worked fantastic, way better than the bought one! Nice one Andre, shrooms are still on my to do list! From one Andre to another, let me tell you, this is beautifuly done, the idea is great , what is the size of it. That is very nice and it makes a great accent for a potted plant. Thanks, about 7” tall 4” Dia. have only wiped it with BLO so far. 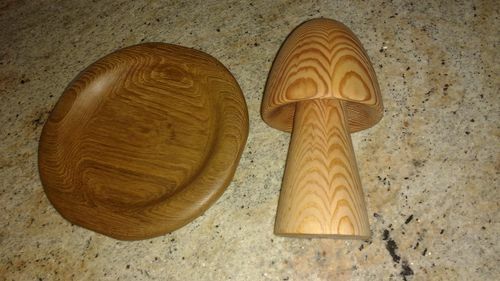 Plate is Teak and 8” Dia. and finished with OSMO. Guess I should add the Pic? You try out your cutter yet, found mine to be way more aggressive than the Easy wood ? Insert is larger and feels sharper!